(Newser) – Penn State's School of Law on Wednesday informed a number of prospective students that they wouldn't have to fork over the $60 application fee—and many are wondering about the timing of the move, the Daily Beast reports. "Congratulations," reads the email. "Your application fee has been waived." 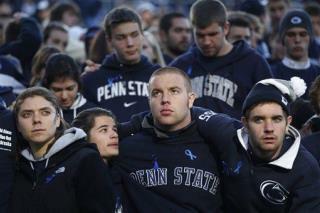 The note references the Jerry Sandusky scandal: "No doubt you have seen recent headlines regarding Penn State," it reads. "Penn State’s new president is dedicated to restoring the trust of all people Penn State serves." Me thinks everyone should apply. Actually Penn State is one of the best universities in the country as far as the education they can get. If you are worried about pedophiles or molestors it is probably going to be one of the safest places to go to school now. It will take a long time to make a dent in restoring its reputation, but in the meantime you can probably get some good deals from them now. But only if you are young and cute.